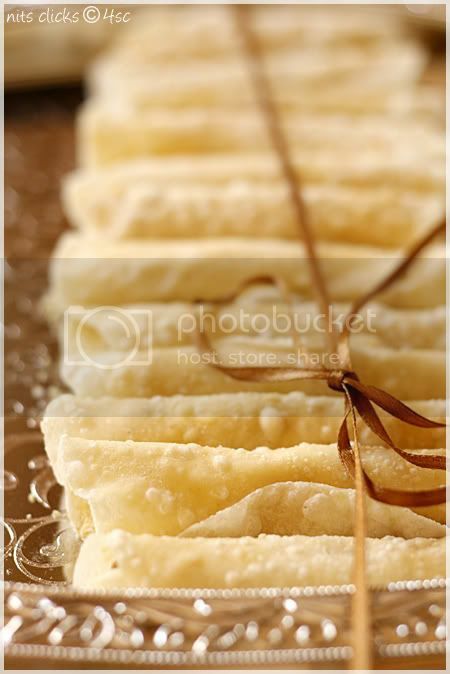 Surrutai poli is a lovely sweet that my family has seen for years. The rolled shape which resembles a cigar is the attraction factor. The mild sweetness with the crunchy texture makes this a wonderful sweet on the whole. Powder the roasted gram and sugar together. Chop the cashews into small pieces. Take a pan and tsp of ghee in it and roast cut cashews and coconut for few mins until the cashews turn golden brown. The filling is ready. Keep this aside. Mix all purpose flour and salt in a bowl. Add water to it little by little and kneed them into a dough. Consistency should be like chapathi dough. Leave it aside for half an hour. Now divide the dough into equal parts and roll into small balls. 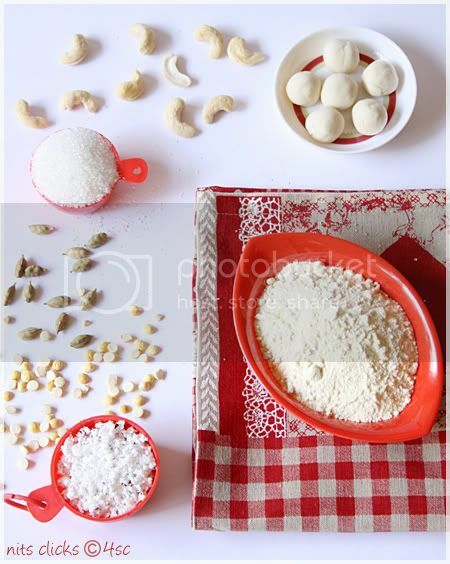 Flour the surface and roll the dough into very thin circles of 10cm diameter. 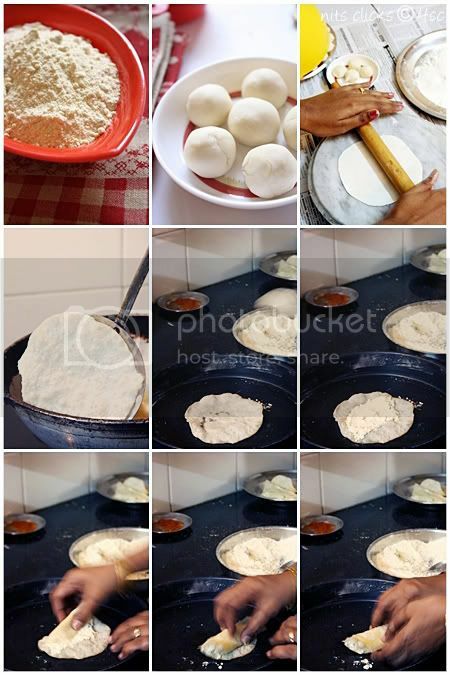 The thickness of the circles should be like papad(appalam). It should be almost semi transparent. If you make it thick, it would puff up like poori when fried. This appalam can have small bubbles here and there but should not puff up totally. After you roll them into circles spread them on paper and leave it aside for ten mins. The rolls would be soft when made, but would become crispy once they are allowed to cool. 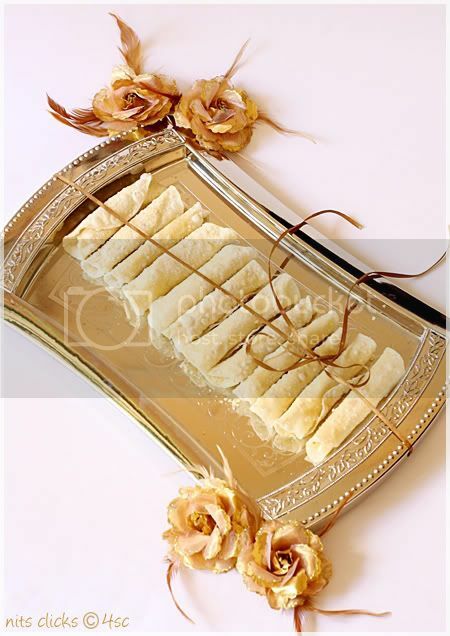 The challenge in making this sweet is the speed in which you work while rolling the fried papad. This quantity would yield 15 surrutai poli. Store them in air tight containers and enjoy for a week. Note - How to eat the broken poli or ones that are soft? This sweet is quite tricky and getting the right crispy consistency needs practice. But there is no harm going wrong. You still can enjoy eating them. They look so delicious! Thanks for sharing it. OMG....fabulous...beautiful clicks n poli dear. Wow...mouthwatering recipe and awesome clicks..
Wowwwwwwwwwwwwww.... My fav recipe.. looks so so so perfect and amazing .. Awesome shots Nithi !! 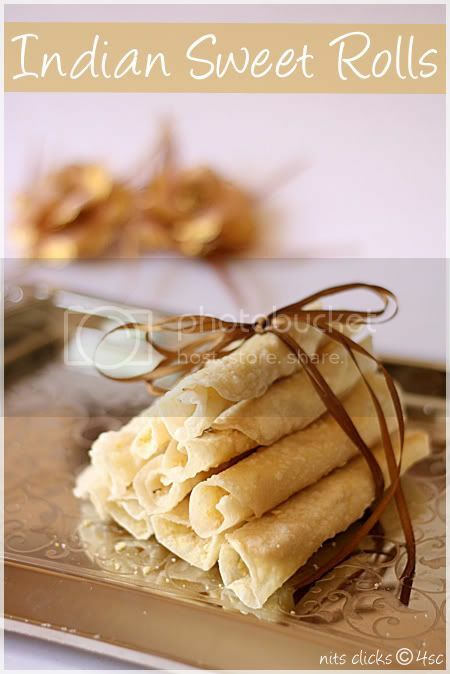 Fabulous clicks, Nithya..Delicious sweet rolls..
Wow really yummy and irresitable sweet poli.. Loved that cute serving tray!! 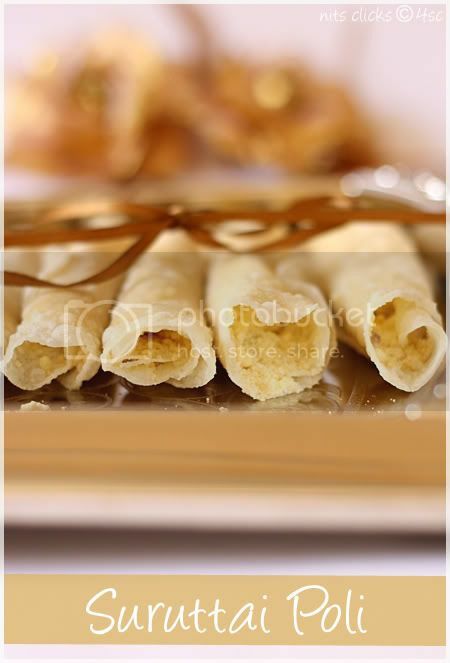 Just prepared some for ICC..i couldnt stop myself having them, thanks for this yummy polis....awesome clicks Nithya.. Absolutely fantastic clicks. This looks really tasty. 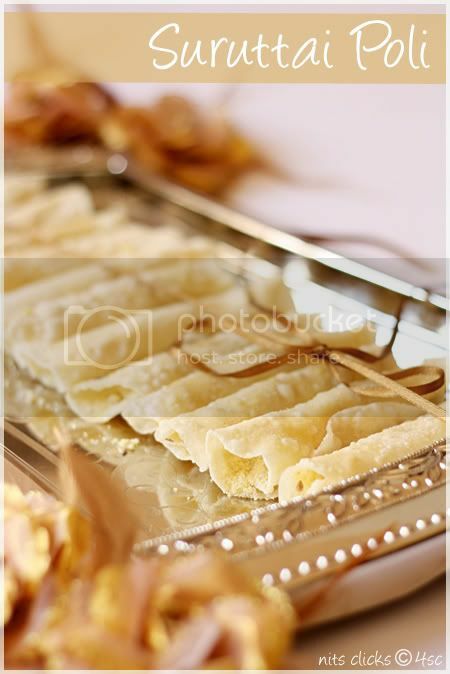 Omg, those looks tremendous nithi...makes me hungry..beautiful pics! Ohhh this Poli looks fabulous! I am digging that tray that holds the yummy yums too! Nice clicks, as always! Nits, the pictures are super and the dish looks simply delish! Wow these are totally worth the long process. What a treat. Looks absolutely yummy and seriously I want to have one right away.. my very fav one.. its been long time now I made this.. Parcel me some Nithi. The polis are looking absolutely stunning. The presentation is perfect and the clicks are lovely. Thanks to your mom for suggesting these, had a great time while making them. Awesome pictures.Lovely recipe.Thank you for the lovely recipe.It was a challenge indeed. Polis looks gorgeous and fabulous clicks as always. Oh Nithya, its tempting me a lot.Thanks for the recipe.The tray looks super! where u got it? Luks Perfect Dear,love all the clicks...too gud precentation. Gorgeous photos and what a great idea to put the broken ones (even if they didn't start out that way, lol) into milk! 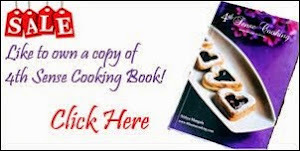 Thats a very lovely recipe from your mom, Nithi! Beautiful clicks. Wow you have inspired so many bloggers with this dish Nitya - looks awesome and crispy! lovely poli and ver inspiring clicks. I'm ur huge follower. I love the way u carry ur cute space. I've tried these polis not as a part of ICC but coz these pics tempted me to do so.. Please do visit my blog. I wud love to hear ur comments..
Wow, they look so perfect, love your presentation and step by step pics dear. On seeing this photos, i could not remove my eyes for long. Great food. I am going to try it. Thanks a lot. This is a great inspiring article. I am pretty much pleased with your good work. You put really very helpful information. Keep it up. Keep blogging. You should visit our website if you are looking for Top 10 web hosting, Top Hosting website, Top hosting companies, Top hosting providers, Top 10 web hosting providers. لتفادي وقوع كارثة في النزهة التالية ، بذل قصارى جهدك لتصريف أي ماء واقف في الفناء أو أحواض أو أحواض الأطفال الفارغة وإبعاد ضيوفك عن البرك أو غيرها من مصادر المياه العذبة الدائمة. هناك منطقة مائية لا داعي للقلق بشأنها ، وهي حمام السباحة الخاص بك - طالما أنه مكلور ويعمل الفلتر ، فإن البعوض سوف ينبض بالحياة.